Before the 8-inch tablets came into existence, the most popular 7-inch tablets and 10-inch tablets were ruling the market. However, many people found the 7-inch screen size too small, since they come with smaller form-factor and also failed to deliver battery life that people were expecting. While on the other hand, the tablets with 10-inch screen size were found to be less portable due to their heavy body and finally, people were left with no choice. Putting this into consideration, the tablet manufacturers then started making 8-inch tablets which became the most preferred by consumers who wanted something that falls between the category of small and big tablets. Since then, the 8-inch tablets are considered as the perfect mixture of work and portability. Well, if you’re planning to buy one, then here’s our buying guide for the best 8-inch tablets. Unlike some of our previous cheap tablet buying guides, this deals basically with all types of budget constraints. So, what are the best 8-inch tablets available to buy in the market? Let’s find them out! 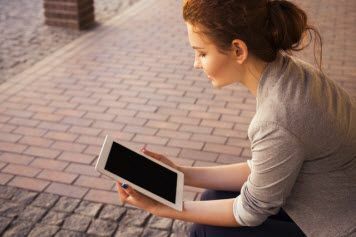 We have picked out some of the best 8-inch tablets which are set to run on the latest operating system. So that you can stay updated with the latest services. Samsung is unarguably the first choice for many in user electronics. And even the vanishing field of tablets is no exception. The Samsung Galaxy Tab A is an 8-inch multipurpose tablet, which ticks all the boxes right. The tablet sports an 8-inch HD display with a resolution of 1280 x 800 pixels, giving it the right quality of the screen, one would expect from a tablet at this cost. Under the hood, the tablet is powered by a 1.4GHz Snapdragon 425 Chipset, paired with Adreno 308 Graphics. The tablet comes with 2 GB of RAM and boasts an internal storage option of 32GB. Although the tablet is slightly tight on memory, it can be nevertheless expanded up to 256GB via a microSD card. The tablet runs Android 7.1 Nougat out of the box, and thanks to Samsung, we expect it to receive regular Android updates. This entire package is backed by a duo of Li-ion batteries which is expected to provide a battery life of around 10 hours of continuous usage. All in all, it’s the right blend of software, hardware, and specifications, which brings this tablet on top of our list of best 8-inch tablets. Plus, you get 3 free months of YouTube Red Subscription with Google Play Music which is worth $50 for free. With the YouTube Red subscription, you can stream YouTube contents without any ads and get access to thousands of YouTube Red originals. No matter how flexible and cost-effective Android OS is, it still cannot stand a chance against iOS, in terms of resource utilization and security. So if you prefer security over flexibility, classic user experience over customization, then the Apple iPad Mini 4 will not disappoint you in any manner. 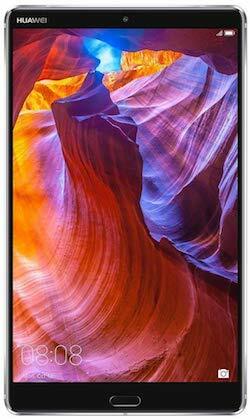 This tablet sports a 7.9-inch beautiful RETINA display with a resolution of 2048 x 1536 pixels. Speaking about the specifications of the tablet, it is powered by a Dual-Core A8 Chip paired with Quad-Core Graphics for a fluidic graphics experience. For all the imaging lovers, the tablet boasts an 8-megapixel iSight camera, which is also capable of recording Full HD videos. This 8-inch iPad comes with 3 options for internal onboard storage. The tablet runs iOS 9 out-of-the-box and also packs in a long list of Apple’s proprietary productive applications. Wait! the best is yet to come, the tablet is backed by a Li-Polymer battery, which can provide up to 10 hours of non-stop entertainment or productivity, based on the user’s usage. 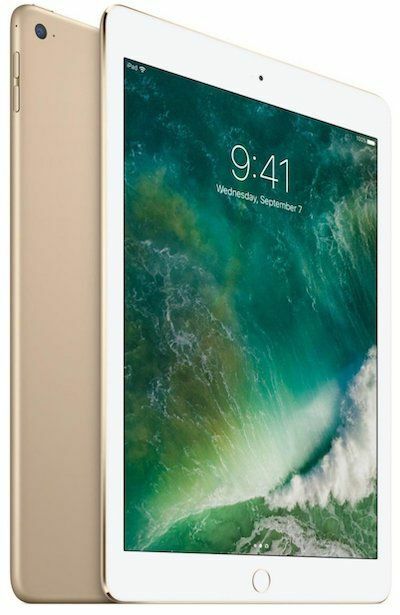 Hardware Specifications of Apple iPad Mini 4 – Best Performance! The Lenovo Tab 4 is the newest tablet from Lenovo that runs on the latest Android 7.1 Nougat operating system which enables you to experience the latest features from Google and adds security to your device. Moreover, the Lenovo Tab 4 is also expected to receive the next update which is of Android O. The Lenovo Tab 4 features a brilliant 8-inch display on the front which has a resolution of 1280 x 800 pixels, while the two front-facing speakers are powered by Dolby Atmos which together will make your favorite TV shows and movies pop. The tablet is very well built and gives that comfort while using it for a long time, making it a good choice for an entire family to watch movies and browse through photos. Overall, the Lenovo Tab 4 is one of the best 8-inch tablets for an entire family to recall their memories and stay entertained as it has a bright and sharp display and loud Dolby Atmos speakers. Under the hood, we have 1.4 GHz Qualcomm Snapdragon 425 Quad-Core Chipset which is optimized specially for budget devices offering moderate performance. However, the user interface and switching between the apps is very smooth, thanks to the latest Android 7.1 Nougat operating system. For seamless multi-tasking, we have 2 GB RAM beneath which is very good at memory management and stores the app data in memory for a long time, so that the users can continue their work from where they left off. Apps like Microsoft Office comes pre-installed so that students and businessmen can start their work straight out of the box. Overall, the Lenovo Tab 4 is one of the best 8-inch tablets for those who are expecting good portability, especially for students and employees. The Samsung Galaxy Tab S2 is assembled with a metal body that focuses more on premium look than its plastic predecessors. Its glass covered metallic front with curved edges seems like the design of Samsung’s Note 7 and Galaxy S7. Weighing just around 0.6 lbs, the Samsung Galaxy Tab S2 is not only lighter but thinner than most of its competitors like iPad Mini 4 and ASUS ZenPad 3S. At the bottoms of Tab S2, we have two powerful speakers which are very loud and clear when it comes to watching movies and TV shows, alongside we have a micro USB port for charging and data transfer, audio jack, and microphone. While the volume rockers and power button are placed on the right side along with the microSD card plate which adds up storage upto 128 GB. Moreover, the display is lighted up with the AMOLED panel which is very bright and produces rich colors with the sharpness of 2048 x 1536 pixels. Under the hood, we have a power-packed Exynos 5433 Octa-Core Chipset and 3GB RAM which handles power demanding apps like a beast and lets you play your favorite games at high graphics with ease. Switching between the apps and overall user-interface seems very smooth, thanks to the latest Android 7.0 Nougat operating system. As far as the battery life is concerned, the Samsung Galaxy Tab S2 delivers 5 hours of screen-on-time on average on a single charge which is not so surprising. The integrated fingerprint sensor on Tab S2 unlocks your tablet effortlessly by just touching the home button and makes your online payments even more secure and faster. 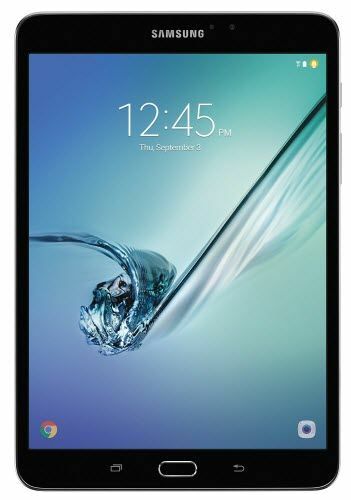 All in all, if you want the best 8-inch tablet, then the Samsung Galaxy Tab S2 is the one you should get as it has premium design and robust performance. For all the music lovers, who needs a tablet to complement their passion for multimedia, your search for an 8-inch tablet should end here. Our current contender, Huawei MediaPad M5, sports a brilliant 8.4-inch Full HD IPS display and provides amazing viewing angles for the users. Under the hood, the tablet is powered by Octa-core Chipset paired with a massive 4GB of DDR3 RAM. Speaking of the storage, the tablet houses 64GB of onboard storage to store apps, photos, and files. On the software front, the tablet runs on Android 8.0 Oreo with Huawei’s EMUI 8.0 on top of it. The tablet boasts a 13-megapixel rear-facing camera and an 8-megapixel front-facing camera. The tablet is capable of capturing detailed images, thanks to its powerful imaging sensor and post-processing software. 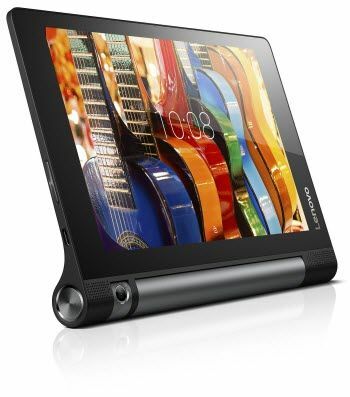 The tablet is certified by, Harman Kardon, to provide a perfect blend of audio and video experience. Moreover, the tablet also supports HiFi headphones, which thumps up base and treble for all the music lovers. All these aforementioned aspects make this a powerful multipurpose 8-inch tablet under $300, which is primarily a multimedia stationed one. Fire series of tablets are proprietary of Amazon and are very well-known to provide reliable performance and a long-lasting battery backup. Our current contender, the latest, Fire HD 8 features an 8-inch HD widescreen IPS display with a resolution of 1280 x 800 pixels with over a million pixels (189 PPI). The display on this tablet is capable of providing bright, vivid, and crisp picture quality. The tablet is powered by a 1.3GHz Quad-core processor paired with a 1.5GB of RAM. 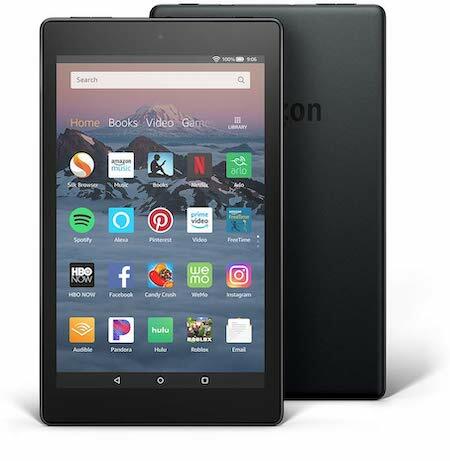 This 8-inch tablet is available in two variants, one with 16GB and another with 32GB and memory on both these variants can be further expanded up to 400GB via a microSD card. The tablet comes in a range of bright flashy colors, which is apt for all the trendy techies. 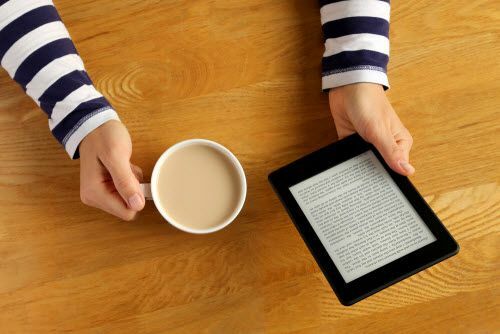 Moreover, you also get free ebooks, and a long list of other Amazon’s exclusive stuff, which is an advantage of choosing this tablet over the others. As far as the battery life of the tablet is concerned, it can stay juiced up to 12 hours of continuous usage. 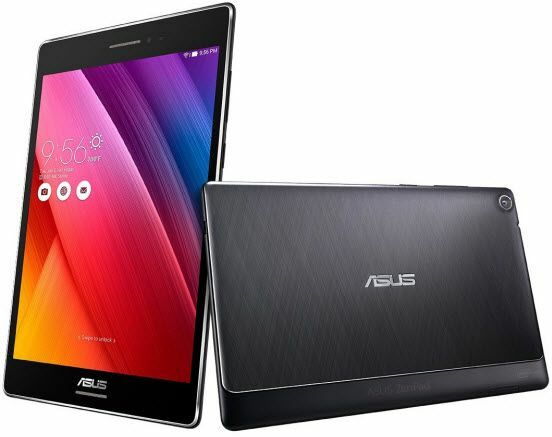 ASUS ZenPad S 8 comes with an eye-catchy clutch-like design and stands out of the segment because of its form factor. 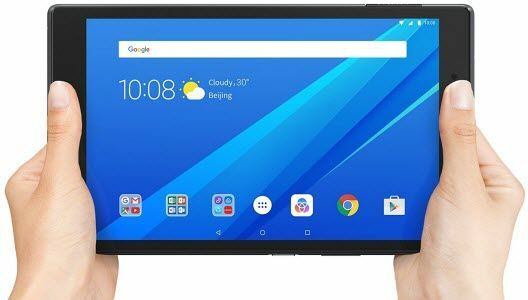 Unlike most of the tablets, the ZenPad S8 doesn’t come with a traditional candy bar design and offers a variation in the design by being a little squarish. Getting to the display on this tablet, it sports an 8-inch IPS display with Full HD resolution. Also, the screen is Corning Gorilla Glass 3 protected and comes with ASUS’s proprietary True2Life display technology for enhanced viewing angles. Under the hood, the tablet is powered by a 2.3GHz Intel Atom Z3580 Super Quad-Core processor. For multitasking, it has 4GB of RAM and 64GB of onboard storage, which makes it a real specification packed tablet at this price. Moreover, the tablet’s onboard storage can be further expanded up to 128GB via a microSD card. The tablet comes with Android 5.1 Lollipop by default and sports an 8-megapixel rear-facing primary camera, which is based on ASUS’s proprietary PixelMaster technology. 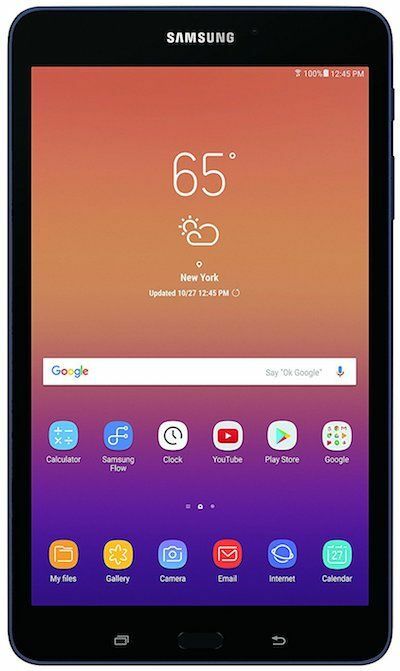 This 8-inch tablet also offers 100GB of cloud storage, which is yet another unique aspect of this tablet. Concluding on this, it offers a continuous usage of up to 8 hours on a single charge. The all new Lenovo Yoga Tab 3 is a budget-friendly entry-level tablet from the company. The tablet sports an 8-inch WXGA IPS adaptive display, which provides decent viewing angles. Speaking about the innards of this tablet, it is powered by a 1.3 GHz Intel Atom Quad-Core Processor paired with 2GB of RAM and 16GB of internal memory, which can be further expanded up to 256GB via a microSD card slot. On the software front, the tablet runs on the Android 6.0 Marshmallow and comes pre-loaded with some of the productivity applications. Moreover, the tablet comes with dual front-facing speakers, which are pumped with Dolby Atmos technology to deliver detailed and crystal clear audio output. On the imaging front, the tablet comes with 8MP180° rotatable camera. 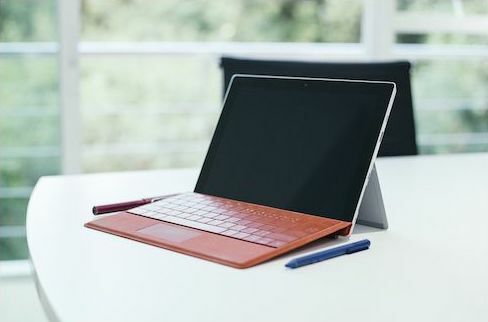 The tablet comes in lightweight ergonomic chassis and makes it easy to grip and carry around. Finally, this cheap 8-inch tablet can last for around 8 hours of continuous usage, which is ideal for an 8-inch tablet. Apart from performance and loud Dolby speakers, the thing we like most about this tablet is the unique kickstand on the back which enables you to stand, tilt, hold or even hang your tablet while browsing the web or watching your favorite contents on the go. The AnyPen Technology of the tablet will save your few bucks from buying a stylus as it supports any conductive object as a pen, meaning now you can take notes or draw anything without having to look at extra stylus. All in all, the Lenovo Yoga Tab 3 is probably the best 8 inch tablet under 200 dollars for media consumption. $170 $140 | Buy at Amazon*Save $30 on this deal! Here is another tablet from Samsung, which managed to attract a wide-range of customers globally. 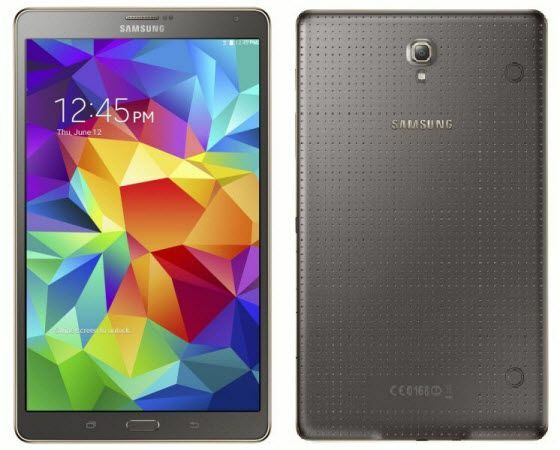 The Samsung Galaxy Tab S offers top-of-the-line specifications for the asking price and is a good overall package. It sports an 8.4-inch Super AMOLED Display with 2560×1600 WQXGA Resolution for vivid colour reproduction and better viewing angles. Speaking about the configuration of the device, it is powered by a 1.9 GHz Exynos 5 Octa mobile chipset paired with 3GB of RAM. Graphics on the Galaxy Tab S are handled by an integrated graphics chips, which takes care of your gaming experiences. Internally, the tablet offers 16GB of onboard storage which can be further expanded up to 128GB via a microSD card. For imaging, It sports an 8-megapixel primary camera and a 2.1-megapixel secondary front-facing camera. The tablet runs on Android 4.4 KitKat, which the company claims will receive regular updates. This 8-inch tablet comes with a fingerprint scanner, embedded in the home button and is thus, a step beyond other tablets in the segment. Overall, it’s a good 8 -inch tablet to buy under budget of $400. 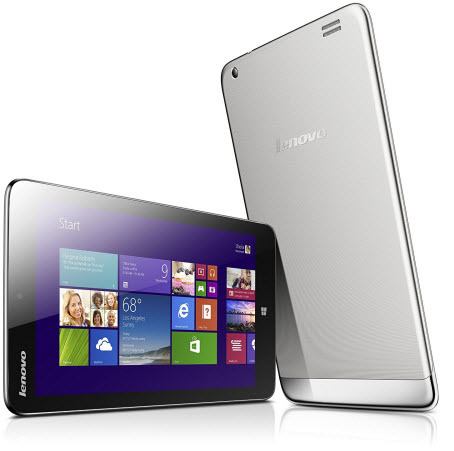 NuVision 8″ is our first Windows powered tablet in the segment. It runs on Windows 10 out of the box and sports an 8-inch HD display. The screen resolution is 1920 x 1200 pixels and has good color gamut. Under the hood, the tablet is powered by a 1.44 GHz Intel Atom Quad-Core Processor paired with 2GB of RAM. On the storage front, the Venue 8 Pro comes with 32GB of internal storage, which should suffice most of the common daily needs. The tablet also boasts a 5-megapixel camera and comes with an ergonomic built, which makes it easy to carry around and use. As far as the battery backup of this tablet is concerned, the NuVision 8″ tablet can last for up to 6 hours on a single charge. 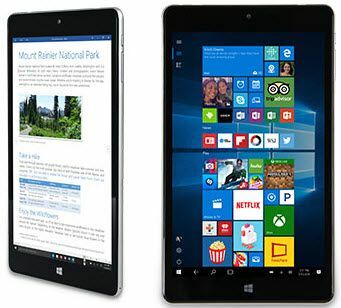 What makes it unique among the other tablets in the list is its, Windows OS, which is considered to be the most productive OS till date. All in all, the NuVision 8 is the best 8 inch windows tablet to buy rightnow. These were our top 10 picks of best 8-inch tablets. On a simple note, the Samsung and Apple are in the tablet industry since long and their tablets are considered as best for all type of works. While the Huawei MediaPad and Lenovo Tab 4 are best for media consumption. For business and productivity, NuVision 8″ tablet running on Windows OS is the tablets you should look forward to. Are you a gaming enthusiast? Are you in search of a powerful gaming tablet to satisfy your hunger for gaming on the go? 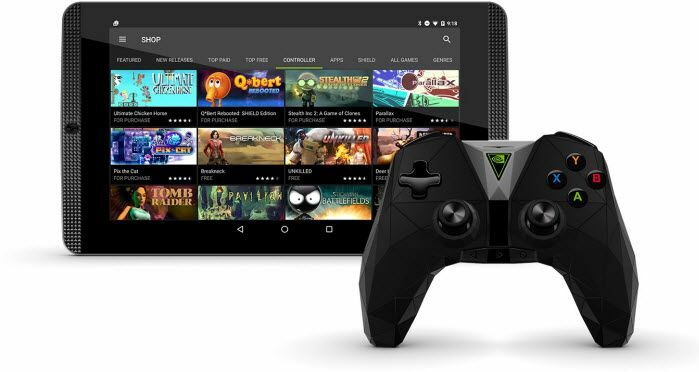 Then We’ve got you covered, the NVIDIA SHIELD, by the name itself is a powerful gaming tablet, which is the very first tablet to house Nvidia’s graphics pro-cessor in the core. Under the hood, the tablet is powered by a powerful NVIDIA Tegra K1 pro-cessor, well-known to feature the very first 192-core NVIDIA Kepler GPU paired with a 2.2 GHz quad-core CPU. The tablet sports an 8-inchFull HD display, which hosts dual-front facing HD speakers on the either sides of the screen. The tablet’s multitasking is handled by a 2GB of RAM and 16GB of internal storage, which can be further expanded up to 128GB via a microSD card. The tablet can be connected with gaming accessories to get the perfect gaming feel on a tablet. However, these accessories are not bundled with the tablet and are sold separately. The tablet runs Android 5.1 Lollipop out of the box and is upgradable to Android 6.0 Marshmallow. For other connectivity options, the table supports 2×2 Mimo Wi-Fi, and Bluetooth 4.0. On a simple note, the Nvidia Shield K1 is one of the best budget tablets under $200. Lenovo is very well-renowned when it comes to consumer electronics especially in the field of mobiles, tablets, and laptops. The Lenovo Tab IdeaTab Miix 2 is a mid-range performance oriented tablet, which primarily retorts on performance. Sporting an 8-inch HD display, the tablet comes with an ergonomic form-factor. Speaking about the specifications of this device, it is powered by a 1.3 GHz Intel Celeron paired with 2GB of DDR3 RAM. The tablet runs Windows 8.1 by default along with a set of other Windows apps. This 8-inch tablet is provided with a 64GB of internal storage. On the imaging front, it is provided with a 5-megapixel rear camera which can be used for capturing images and videos and a 2-megapixel secondary camera for video calls. It is provided with a reliable li-ion battery, which the company claims to deliver for around 10 hours of continuous usage. Still can’t figure out which is the best 8-inch tablet for you? Don’t worry! Shoot us an e-mail at our Contact Us page with your budget and requirements, our team of tablet professionals will find the best tablet match for you.